The OBAMP plugin allows multicast traffic to be forwarded in a OLSR mesh network. OBAMP is an overlay protocol. It first makes a mesh network with overlay links (udp tunnels) between the OBAMP nodes, and then it creates a distribution spanning tree over these mesh links. 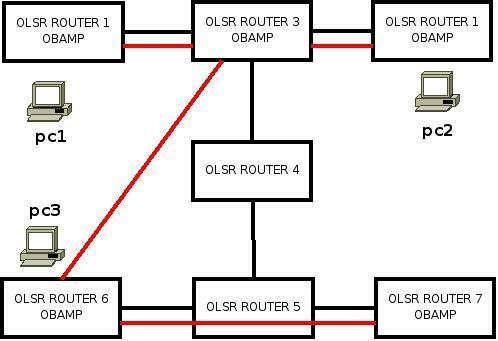 The current version of the OBAMP protocol, implemented as an OLSR plugin, is a simplified one for Wireless Community Networks, where we assume the nodes to be in fixed positions on the roof of the houses. Protocol features regarding mobility have not been implemented (yet). To explain how the plugin works consider the scenario in the following figure. Diese Seite wurde zuletzt am 3. September 2009 um 15:53 Uhr geändert.